Slayer Guitarist Jeff Hanneman Dies : The Two-Way Hanneman was one of the most influential guitarists in thrash metal. He died Thursday in Southern California of liver failure. He was 49. Slayer guitarist and founding member Jeff Hanneman died Thursday of liver failure. He was 49. Jeff Hanneman, a guitarist for the thrash metal band Slayer, died Thursday of liver failure, the band announced in a statement on its website. "Slayer is devastated to inform that their bandmate and brother, Jeff Hanneman, passed away at about 11AM this morning near his Southern California home," the statement said. "Hanneman was in an area hospital when he suffered liver failure. He is survived by his wife Kathy, his sister Kathy and his brothers Michael and Larry, and will be sorely missed." 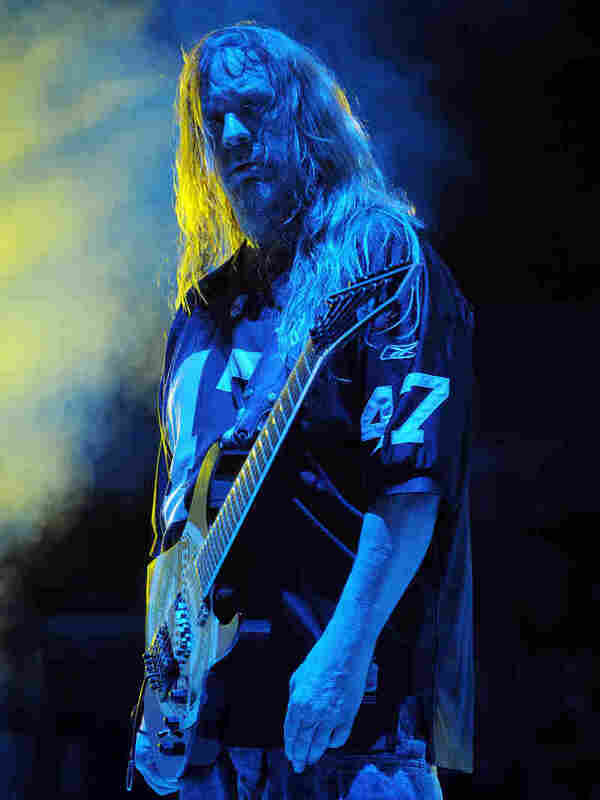 "Born in Oakland, Calif., and a devoted Raiders fan, Hanneman was raised primarily in Long Beach and became fascinated with wars and military campaigns — themes he'd bring to Slayer's music — via his father, a World War II veteran, and brothers who served in Vietnam. He met [guitarist Kerry] King in 1981 and decided to form their own band, mixing heavy metal and punk influences and signing with Metal Blade Records for Slayer's first two albums, Show No Mercy in 1983 and Hell Awaits in 1985. The group made an eyebrow-raising move to the hip-hop label Def Jam in 1986 for the covers album Undisputed Attitude and the classic Reign in Blood." Metal fans and stars took to Twitter to express their condolences. Hanneman is probably best known for his work on 1986's Reign in Blood, for which he wrote "Raining Blood" and "Angel of Death." In the 1980s, Slayer, Anthrax, Megadeth and Metallica were the big four bands of the genre.